Cyclists are often a bit funny about their tan-lines. Cultivating a set of razor-sharp transitions, which switch instantly from the deepest mahogany to a blinding alabaster white, half way along a thigh or bicep is seen as one of the heights of being ‘pro’. 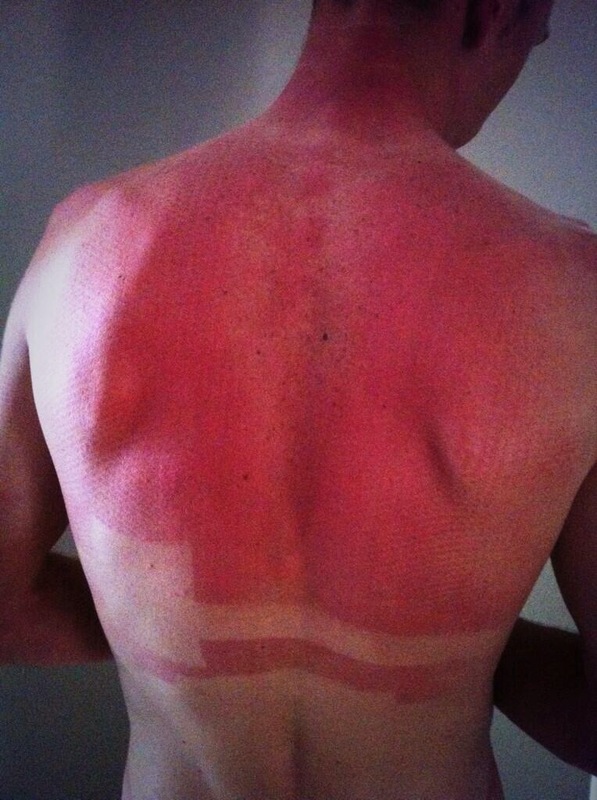 Tan-lines like these tell of days in the saddle, not days on the beach. They are worn with more than just pride; for many they are a badge of honour. Last week however, we saw a couple of cases of cases of pro team ‘tanning’ getting out of hand and raising questions about protection and performance. Firstly Samuel Dumoulin of AG2R tweeted an image of his own alabaster thigh marked with the lettering of his team name in an uncomfortable-looking pink tinge. Having reluctantly discounted a “Jarhead”-style initiation ceremony branding, at first appearance it seemed that AG2R’s new kit supplier Descente had managed to make the coloured parts of the team’s famous brown shorts UV protective but not the white logos. Perhaps, we thought, it’s a cunning marketing ploy to ensure that the sponsor’s name appears even during massage table interviews and in the moody black & white photos from the Roubaix showers when the kit comes off. So we asked them what was going on. “I respectfully wish to clarify this is definitely not sunburn: that would be impossible. The team’s shorts are made with Miti’s high-density, high-gauge warp knit nylon/spandex which has a high UV protective rating of at least 50. The shorts are screen printed with the sponsor’s name with a plastesol type stretch ink. “We did this in order to ensure the exact correct brown color on the shorts fabric as it is very difficult to exactly reproduce the correct brown through sublimation printing. “What happens is this: on extreme days where a rider goes very hard, the skin under the screen printed area is not able to breathe as well as the rest of the skin, hence it achieves a different temperature, therefore it appears “pink”. Furthermore the compression of the short is quite high and the screen printed areas produce a slightly higher area of compression , actually leaving an indentation on many riders. In a nutshell: Skin can’t breathe as well under the applied logo areas as it can through the rest of the shorts. It gets hotter and therefore gets pinker. This seems reasonable enough but I’m still amazed that the letters imprinted so clearly on Dumoulin’s skin. Hugh went on to say the low body fat of pro-cyclists can add to the effect. He also noted that during his time working with CSC, David Zabriskie was the most sensitive rider he had ever worked with. Zabriskie even had all the grippers removed from his shorts and had custom chamois pads made as he was sure they caused a reaction, even though, as they were made from inert silicone, this was impossible. So, Case #1 answered. A reaction to heat, but definitely not sunburn. Case #2 definitely is sunburn. No-one is disagreeing with that. But the next piece of kit to be put under the social media microscope last week had already caused a stir over the Christmas period. 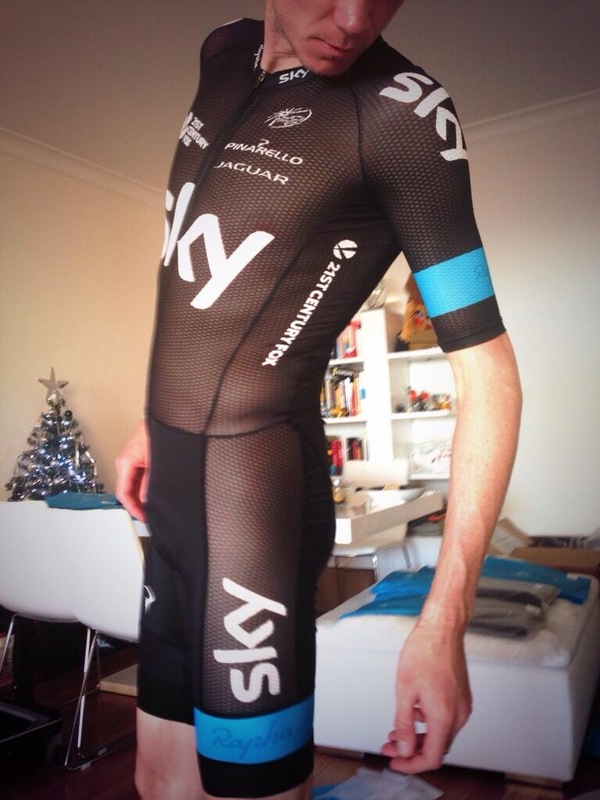 When Chris Froome first posted an image of himself wearing a very revealing Team Sky mesh skin suit the initial questions were those of common decency. Was it right to have riders working on international TV in something quite so exposing? Of course everyone knew that, as this is Sky, there must be a performance benefit. The more holes in the suit: the more breathable it is. Simple. But the mesh suit was quickly likened to Cher’s “Turn Back Time” body-stocking and a number of other saucy outfits. Much hilarity ensued. However, the follow-up picture last week of Froome’s extremely sunburnt back after a training ride in the mesh skin suit immediately led the questions back to those of performance and safety. Tweeted by his fiancé Michelle Cound with the comment “#OUCH”, the picture caused a stir that went well beyond social media joking and quickly transitioned into the traditional media. Questions about Sky’s judgement and the kit supplier’s expertise were well to the fore. Clearly a sunburnt rider is not going to be able to ride as well, and the ventilation gains that the suit provides could be more than offset by the drop in performance the following day. Was this suit only supposed to be used in certain conditions? The clear implication was that the suit was to blame. The Jersey Pocket spoke with Team Sky kit supplier Rapha to find out more about the “Froome-Burn” issue. Their Head of Marketing, James Fairbank who, whilst not commenting directly on the picture in Michelle Cound’s tweet, spoke about the mesh suit’s history and usage. “Team Sky started using mesh jerseys at the Tour Down Under in 2013 and even at that early stage we were well aware of the potential for sunburn if sun screen wasn’t used. The same fabric was also used in jerseys worn in the Tour last year, they were supplied with the caveat that it doesn’t provide much UV protection and that sun screen would need to be applied underneath them. Team Sky didn’t respond directly to the photo either but the message was similar. User error. End of. Froome and Cound have both also remained silent on the issue, which is perhaps surprising in light of the bredth of coverage. A simple “Oops, my fault.. Forgot the Factor 50 under the bits with holes in it” would have worked wonders to curtail the rapidly escalating debate. One suspects that there has been a pretty blunt, “What on Earth..?” conversation between Dave Brailsford and his star rider about the Tweeting of the picture in the first place. This is not the kind of coverage the team or the sponsor wants. It will also be interesting to see if Froome wears the suit again and what he says about it then. So, this doesn’t quite herald the the end of traditional sharp tan lines. But it is a timely reminder that we all need to look after our exposed skin when the weather warms up. The oddest thing here really is that big teams are missing a trick by not already telling us which suncreams they use. And the learning for the Pro’s from this little sunlit storm in a teacup? Always slap on the sunblock under a mesh jersey.. and don’t tweet so many Selfies.. This entry was posted in Pro cycling, Style, Uncategorized and tagged ag2r la mondiale, counde, Cycling, froome, mesh, procycling, skin suit, sky, sunburn, tanning, team sky. Bookmark the permalink.